Form: Cushion, up to 10cm across, "occasionally with fistular proliferations". Colour: Pink-pale rose, greyish-rose; becomes creamy in alcohol. Smell: Slight marine "perfumed" smell. Consistency: Quite firm but compressible. Rather crumbly, especially in alcohol. Surface: Fairly smooth, with distinct reticulation showing through. Heavily punctate. Apertures: Oscules scarce, 1-2mm diameter; flush with surface and not very noticeable. Skeleton: The interior is an irregular net, basically of few-spiculed primary tracts with single spiculed secondaries, but the many 'loose' oxea give a distinctively confused appearance. The ectosome is an irregular and confused subisotropic reticulation. A little spongin is present at some nodes. Spicules: Straight or slightly curved oxea (a), with rather long and sharp points, 160-270 x 5-11µm. Sometimes a few strongylote and centrotylote modifications are found. Weakly curved sigmata (b) are present, ca. 10-37µm. These may be quite rare in some specimens and numerous in others. Habitat: From the upper sublittoral to ca. 60m in the sublittoral. "On stones, conglomerates of shells, calcareous algae, sponges etc." In W. Anglesey it is only found growing over massive specimens of Stelletta grubii (q.v. ), where it is quite common. Distribution: "British Isles, Atlantic coasts of France, Mediterranean, ?áSpitzbergen". Known recently from Anglesey, Lough Hyne, N.áCornwall, Padstow. Identity: The colour in a cushion together with the spiculation is quite distinct in the larger specimens, but may be less reliable as a field characteristic in smaller. Microscopically, the reneroid skeleton with only sigmata as microscleres is characteristic. 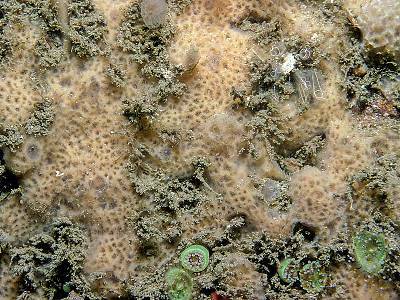 The sponge appears to be relatively uncommon, and more records would be welcomed. Voucher: BELUM : Mc789. DM 218. Raven's Point, Anglesey. Coll. D. Moss.